When considering Fine Antique Furniture, the names that immediately spring to mind include Thomas Chippendale, George Hepplewhite and Thomas Sheraton, generally known as the big three. Thomas Chippendale (1718-1779) was born in Otley in 1718 and was a London Cabinet maker and furniture maker working in the Neo-Classical and English Rococo styles. His principle book of designs was The Gentleman and Cabinet Makers Directory. 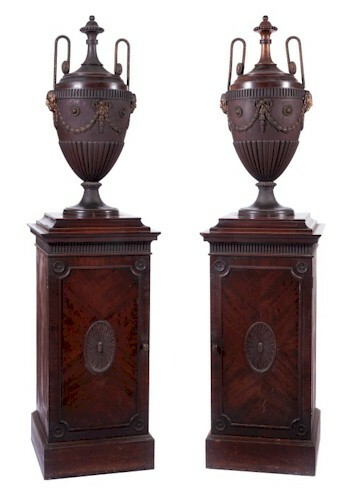 A pair of mahogany sideboard pedestal vases, with gilt brass mounts to a design by Thomas Chippendale. A similar pair appear at Paxton House, Berwickshire, Scotland. With George Hepplewhite (1727-1786), it is interesting to note that it was only after his death that his widow Alice Hepplewhite published a book of his designs The Cabinet Maker and Upholsterers Guide. Thomas Sheraton (1751–1806) gave his name to a style of furniture characterised by a feminine refinement of late Georgian styles. His four part Cabinet Maker and Upholsters Book greatly influenced English and American furniture design. There were other important designers and makers of Fine furniture in the 18th Century: notably George Bullock, a sculptor and furniture maker from Liverpool (Circa 1777-1818), who was noted for high quality furniture in indigenous woods such as English oak and elm; William Linnell and John Linnell who were a father and son partnership – John Linnell was one of the first English furniture makers to be educated in design, studying at the St Martins Lane Academy, which had been founded by William Hogarth. 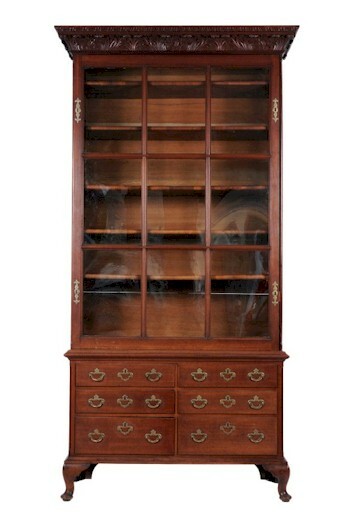 An example of a 'Pepys' bookcase. Designed by the famous 17th Century diarist, Samuel Pepys, and originally made by dockyard joiners, the example illustrated here fetched £20,000 at auction. Other makers of fine furniture include Robert Adam (1728-1763) who is perhaps better known as the designer of Syon House, Harewood House and Pulteney Bridge, but also produced masterpieces of furniture and interior design. John Mayhew and William Ince were a partnership of furniture designers in London from 1759 to 1803. Their book The Universal Stystem of Household Furniture was issued in imitative rivalry to Thomas Chippendale. Ince and Mayhew provided furniture for a number of Robert Adams' patrons, including the Duke and Duchess of Devonshire at Chatsworth House.